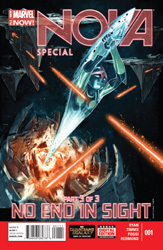 Note: Nova Special #1 is the third part of the Uncanny X-Men/Iron Man/Nova crossover 'No End In Sight'. The first two parts of the story occur in Uncanny X-Men Special #1 and Iron Man Special #1. The story so far: Monark Starstalker has been hired by an intergalactic weapons dealer to kidnap Alex Summers. However, he abducts Scott Summers (Cyclops) by mistake. 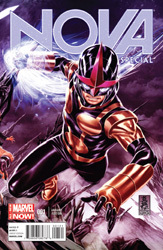 Realizing his error, he seeks out Nova only to find that Rich Rider is presumed dead and replaced by Sam Alexander. Meanwhile, a group of Cyclops' students pose as SWORD agents to find the location of Cyclops. They are joined by Iron Man. Once they figure out the location of their leader, they leave Iron Man behind on an alien world. Sam Alexander explains to Monark that he is only 15 years old and doesn't know how to help him in his situation. Monark Starstalker pleads with Sam for help and the teen hero finally agrees to talk to the man who hired him. But he makes it clear that he can't force anyone to do anything. He can only try to convince Starstalker's employer to leave him alone. Elsewhere in space, Iron Man has been picked up by a SWORD spaceship. Tony instructs the crew to trace other SWORD ship's signal in order to track the X-Men. In his mansion on an alien world, Monark's employer Atratus has fallen in the bathroom due to his age. His daughter helps him up and they go eat dinner. She tells him that she has no update from Starstalker's mission. Suddenly they hear a large rumble outside their home. They discover the X-Men have arrived! Magik demands the return of Cyclops only to Atratus's daughter claim to know nothing about she's talking about. She orders her security force to attack if the X-Men don't leave the premises immediately. The standoff is suddenly interrupted by the arrival of Starstalker's ship! Nova and Monark exit the ship and begin talking to the X-Men. Atratus comes out of his mansion and wants to know if Monark has Alex Summers. The bounty hunter tells him he does not have him but Nova confirms to the X-Men that they have Cyclops. Atratus's daughter begins counting to five at which time her security team will attack them all. As she is about to say five, Iron Man's SWORD ship appears! Atratus's daughter orders a full attack on everyone! The security force is quickly forced back by the X-Men and Iron Man. Meanwhile, Nova and Monark Starstalker chase Atratus and his daughter back into the mansion. With the security threat regrouping, Magik demands Cyclops be turned over to them. Iron Man refuses due to Scott Summers status as an international criminal on Earth. Iron Man and the X-Men prepare to battle each other when Tempus of the X-Men freezes Iron Man, the SWORD agents and the security force. The X-Men go into Starstalker's ship and rescue Cyclops. They get back into the SWORD ship and leave the planet. Inside the mansion, Nova and Monark discover the dead body of Atratus. He had fallen from a ladder in his library. Monark Starstalker tells Sam Alexander that his situation hasn't changed very much even with Atratus's death. He still has no money. Nova asks him if he's going to be okay. Monark admits he doesn't know and leaves. Atratus's daughter is informed of her father's death, Iron Man talks to Monark while Nova contemplates the day's events. Later, Tony Stark and Sam Alexander talk about outer space and life. Sam admits it's overwhelming at times. Tony advises him to try and enjoy the view.